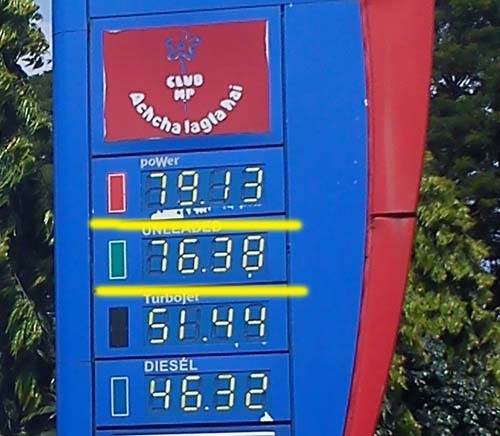 At the IOC pumps the price is Rs.76.37. The petrol price rise shows the height of inefficiency of our government. On comparing with other neighboring countries like Sri lanka & Pakistan it is of the order between Rs 38 to Rs 40 a liter .The reason for the price hike is due to the vested interests of top officials in oil companies and the Ruling government. The only solution to this problem is revolt severely against this demon of price rise. Shame on the oil company and ruling government. , they should be kicked and thrown out. COME ON ALL BELGAMITES AND THE PEOPLE OF INDIA REVOLT OTHERWISE FURTHER INJUSTICE WILL BE POURING ON US.